Arrived in Washington, DC for an internet marketing course and had three hours to see the “highlights” of the capital. 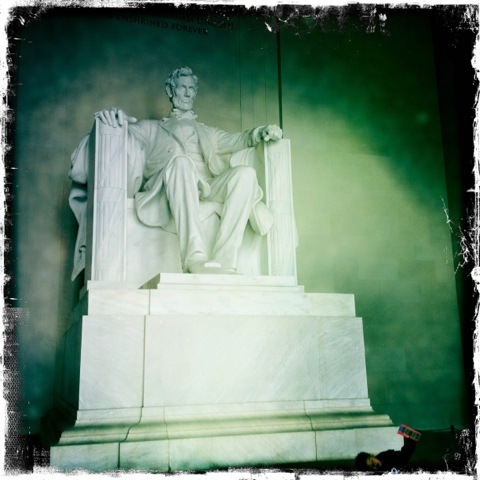 I found a driver who was quite patient and helpful and he took me to the capital, the white house and the Lincoln memorial. In each of those places, as it was a rainy day, there were more police and soldiers than tourists. Sad, sad commentary. Anyway, I walked up the steps of this iconic memorial and was taken in by the prayer like attitude the few fellow tourists displayed. It was not until I enlarged this photograph that I noticed the small child in the lower right hand corner. A sweet surprise! This entry was posted in Lincoln memorial.